It is something most of us think about when going on a trip, but sometimes accidents happen, causing someone to get hurt. Even a popular place like Walt Disney World only allows their cast members to have basic supplies like band aids. Whether you go to a five-star resort or camping in the wilderness, a first aid kit can make all the difference. Think about this scenario. Getting a cut while traveling is a common occurrence, even at the beach. According to resent news, a few people have obtained a rare, but deadly, bacterial infection from cuts. Yet, a simple antiseptic wipe would have prevented the cut from becoming infected. A couple of these people were at the beach and most likely did not think of taking a first aid kit with them while on vacation. What Should You Place in a Kit? While this list is not everything, it has the essentials of a basic first aid kit that you should have. Not only should you have a good kit, but also you should be prepared to render first aid. Anything from choking to shock can occur while you are traveling. Slips and falls are the most common injuries. Knowing how to react during a traumatic situation could save someone’s life. No matter where you are, the first thing you should is to have someone call emergency services. Next, check for hazards. After that you should access the situation. Ask the person, “Are you Ok?”. If there is a response, then you know the person is breathing and alert. If there is not an answer, you will need to assess the situation. If you are not certified in CPR, ask if someone nearby is. If not, you should begin some type of aid. Please the person on their back, but do not move them as this could cause more injury. When someone is bleeding, you need to stop the bleeding. 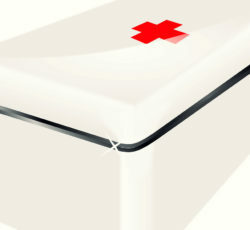 If it is small cut, light pressure with a sterile bandage or cloth from your fist aid kit will work. If it is a deep cut, a tourniquet above the can help slow the bleeding. Contrary to popular belief, do not put oils or butter on a burn. Wash the burn with cold water and apply a cold compress to help bring the temperature of the area down. For severe burns an antiseptic may be needed. If you have a burn gel, place a light layer over a burn.